This entry was posted in Admin, Communications, Education, HE, Management, Students, University and tagged Accountability, Administration, fees, finance, HE, HEFCE, Students, universities by Paul. Bookmark the permalink. Thanks for the link, Paul. I don’t think that in fact we’re that far apart. If you have so much data that the water is muddied, then almost by definition (or certainly by metaphor) you don’t have transparency. The trick is to identify the information which will help people to make informed choices, and present it clearly and well. This is why expertise matters. There’s two big problems, though. The first is that the ideology of big data is that people can sift it themselves to find meaning. And maybe sometimes they can. But applicants to university are likely not to really know what they are signing up to, and therefore what questions to ask. Like buying your first car, it make a lot of sense to take with you someone who knows what they’re talking about. The second problem is that the financial information isn’t really about student choice, I suspect: it’s part of the campaign for universities to focus more resources on student issues and is similar, in that regard, to arguments about VC’s pay. 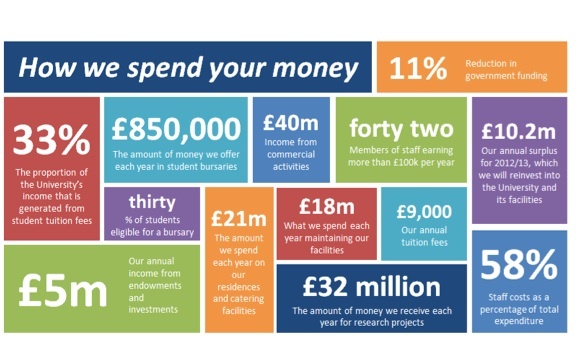 And as university accounts are in the public domain, the sensible approach for a university is to make the information meaningfully available, before NUS hire someone to do that job, but with a different slant.